Blousey: Victoria May's 'Hair Shirt' is woven with real human hair. SOME WAG once observed that men with hair never think about it, and men without hair think about nothing else. As one in the latter camp, I am attuned to the possibilities and anxieties at "Hair Raising," the new show at the San Jose Institute of Contemporary Art. For the dozen artists represented, hair is both a new material to manipulate and a totem fraught with personal and societal perils. Victoria May combines couture with human hair. Her wittily titled Hair Shirt turns the traditional notion of a penance garment into a blouse finely interwoven with beguiling curls. 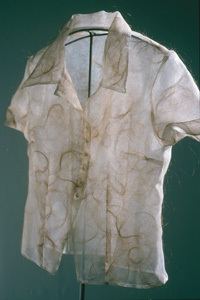 Paula Santiago embroiders her own hair and that of her relatives and friends into children's garments made of rice paper and wax; one of these fragile yet sturdy structures, encased in a vitrine, is stained with a dark rust-red pigment that turns out to be blood, emphasizing the deep connections the artist feels toward her loved ones. In the center of the gallery, Wrenay Gomez Charlton has erected a free-standing ladder made from thick strands of human hair. The ladder has the sturdiness of hemp, and yet it is easy to imagine that every step might pull painfully on the invisible head from which the tresses fall. The most adroit use of hair as a novel medium is the least appealing at first glance. Kerry Vander Meer took to playing with long soapy strands of her own hair as they fell out in the shower. She transfers these impromptu tile sketches to paper mounted on wood. They look like spontaneous figure studies done with a fine-point pen. In a more symbolic vein, Diane Jacobs uses her own hair to critique society's obsession with blondeness. In Balance, one small ball of blonde hair sits on a weighing tray equaling an entire pile of Jacobs' dark hairballs. In Grind, a mass of dark hair is cranked with a meat grinder to turn into blonde hair. The message is highly didactic, but the use of antique found objects (the balance and the grinder) gives the pieces the flavor of funky assemblage. In her installation Tags Steeped in the Past, Renee Billingslea dangles old luggage tags from a woven grid. Each tag contains a photo or a token of injustice (mostly from the slavery and Jim Crow eras). Each tag is attached by a single strand of hair. 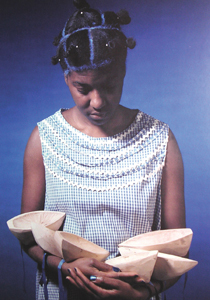 The same motif of connectedness crops up in the superb photographs by Cuban artist María Magdalena Campos-Pons, currently on display at MACLA. Tree of Life is a triptych of photographs depicting a long, thick three-pronged human-hair rope in the shape of a traditional sugar-harvesting tool. Dangling from the rope are three smaller pictures from the artist's past, a past to which she is inextricably linked by blood and memory. Replenishing consists of a three-part life-size portrait of the artist's mother linked to a matching self-portrait by a single framed image of a strand of beads held at the ends by mother and daughter. Campos-Pons' photographs are so strong that they overshadow her wan installation ("Unfolding Desires") and a New Agey video that morphs close-ups of flowers with deep-space images of galaxies and stars.